Hello and thank you for stopping by, a new challenge begins today at the Lacy Sunshine Challenge Blog with the theme being: Christmas Confections - (Christmas Related Sweets and Treats). Here is my inspiration for this challenge. I thought roasting chestnuts, candy canes and cookies for Santa are certainly related to Christmas treats. I'm using Rory Roasting Chestnuts, Rory's Bag of Candy Canes and Cookies for Santa was a gift to the members of the Lacy Sunshine Group on Face Book by Heather Valentin. The other 2 images of Rory are from Lacy Sunshine's online store where you will find an amazing assortment of characters and so much more all created and designed by Heather Valentin, artist and owner of the shop. I hope you'll come over and join in this challenge sharing your creations with us. I enjoy visiting your blogs and gaining some of my inspiration along the way. I have a die cut for the 3 panels for this card, colored with copics and colored pencils, added some Puffy Paint for the snow, a little flocking on Rory slippers, Glossy Accents here and there along with glitter, and Stickles. The snoflake is from Martha Stewart punch. Hello, good day and thanks for stopping by. There is a new challenge that begins today at the Julia Spiri challenge blog with a fun theme: Doll House. I hope you'll come by and join us in this fun challenge. I thought I'd use Girl with Pigtails from the Julia Spiri Etsy store, where you'll find so many wonderful images as well as a nice variety. The house and roof are cut from cs, roof and embossed with the Sizzix brick and wood folder, the path was embossed with the cobble stone folder, on either side of the path I added various colors of Flower Soft. Good morning, thanks for stopping by, there is a new challenge which begins today at Crafting for all Seasons. 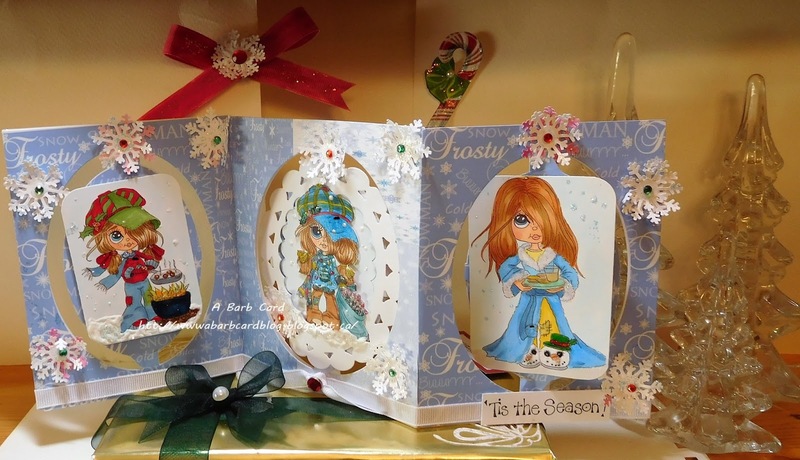 This week the theme is Anything But a Card and our fabulous sponsor is Chrishanthi of PPinky Art Dolls the amazing artist and creator of these fabulous images and so much more such as her hand made dolls that are beautiful. I chose to use Bear Friend from the P Pinky Dolls Art Etsy store and make a fridge magnet/paper weight. Colored with Copics and using Modge Podge adhered the cs with the image to a ceramic tile then laying 3 more coats of Modge Podge, attach a magnet on the back and that's it. I hope you will come and join us in this challenge sharing your creations with us. Hello and thank you for visiting, there is a new challenge which begins today at the Lacy Sunshine challenge blog with the fun theme being: Angels Sing. 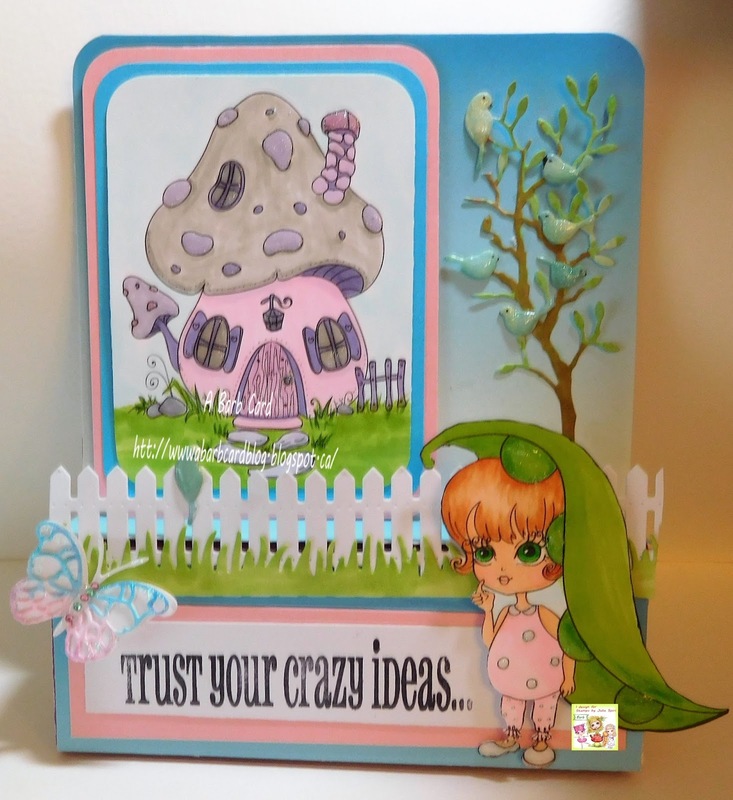 I'm using a digital image from the Lacy Sunshine online shop where you will find a huge variety of wonderful digital images and so much more. For this challenge I'm using: Angelic Music, perfect image for this challenge theme or so I thought, it was difficult to make a decision. I hope you'll come and join in this challenge, I do enjoy visiting your blogs and gaining inspiration along the way. Colored with Copics, cat is a die cut, sentiment is a stamp from my stash, music notes are from a punch. As you Like it: Male or Female and why - Female, girls are just so much MORE fun.